It happened to me when I was workingt at an airline company as a flight attendant twenty years ago. The journey was from Madrid to New York. A passenger sat down in a wrong place.So I had to suggest her that she should change to another seat located in the cheaper part of the plane according to her boarding pass; however, this woman didn't obey me at all. She decided to continue in the same place despite my suggestion. She was an illiterate woman and she didn't understand that there were different types of seats in the same plane. I didn't know what to do about this situation. The woman said to me he wasn't going to move from this seat to another in any way. I had to inform the pilot and co-pilot about it. The copilot tried to persuade her but, it was impossible to resolve this misunderstanding. Eventually. 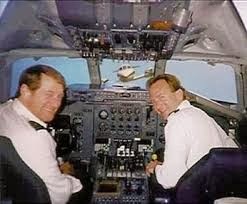 the pilot had to resolve the complicated situation. He had an illiterate girlfriend, so he knew how to manage in these cases. He approached her and muttered something with a lot of tenderness. Suddenly, he stood up and sat down in the right seat. I said to her that the seat where she had sat down didn't go to New York.